Print this out or copy into your own blog. Tick them off as they are completed. There seems to be a slacking of work and a reduction of concentration. Here is a reminder (after the video) of what you should be doing/completing. 8. Checking out links: and practising! The pathetic attempts a few hours ago where you thought demand was supply and supply was demand and two people even thought a PPF had a price on and the PPF shifted to show demand.....I despair! 9. You were supposed to be doing questions on market failure - but no-one bothered and that's why when asked about it pink people just looked confused. 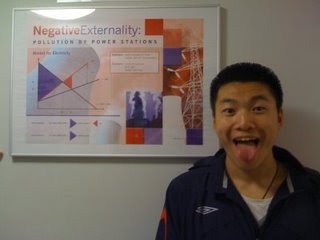 If you pretend you don't know about externalities then ask the person in this photograph! 11. It was only voluntary for some Business Studies students - but they could still have done it! You need all the practice you can get! 12. EIGHT Economics students were supposed to be doing this. Did all eight do it - I think not. Take responsibility for the other members in the group! 13. Business Studies students - what has happened? Where is it? 14. More lack of work by Business Studies students - you've missed ICT this week. What's happened? Why didn't you use the spare time? 15. I see you are failing to take advantage of outside opportunities either - student life is not just going from Residence to class to Red Bull shop to Residence. There are other things to do that would help you. 18. Set a week ago for Economists, what happened to Long's entry? Rinat's? COLLECTIVE RESPONSIBILITY. Work to help each other. If you don't then some will be dragged down to such a low level they will think a PPF is a demand curve, that S - S1 is the opposite and that D stands for David and not 'demand'! 19. Some people are studying Philosophy - what happened to putting it into practice? 20. Even though I cover something in a blog and in class, pink people still claim never to have seen things or read them.Read and revise - all the time! 21. 'Do not forget' - but you did! 22. Are the weaker members constantly improving their English? If not then this will hold back others so make sure that everyone practises using this. 23. Business Studies students should be working through these articles. 24. So, no-one interested? That's fine...I suppose. And don't forget to watch Youtube! Remember always to return to this - and that your long term is to rise above this. Christmas is coming - what would make your parents happy?